Please contact us if you need any help measuring for pull out shelves or other kitchen accessory, or if you are having any troubles whatsoever with the ordering process. We look for feedback from our customers so we can make our store easier to use. We created this FAQ page to provide an easy way to answer the most common questions. We are able to provide this because of the questions we receive, so please ask away! We answer questions as quickly as possible, usually within a few hours, seven days a week. Measuring for sliding shelves should not be difficult. Unfortunately making a website to order custom sized roll out shelves for kitchen base cabinets is. Any help you can give us with your questions or suggestions will be greatly appreciated. Q. My cabinets are 23 1/2" deep but you don't have a shelf in that depth? A. 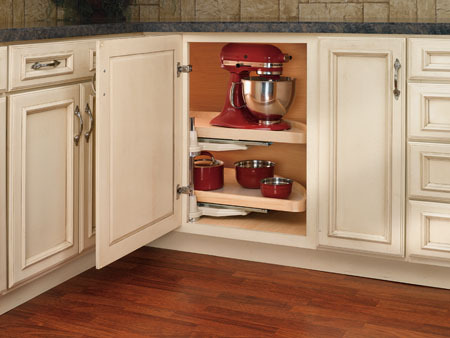 Most kitchen cabinets are between 22 1/2" to 23 1/2" deep from the back of the face frame to the back wall. We want some room in front and behind the sliding shelf so that you are not stuck with a door that won't close or a bowl that hits the back wall. 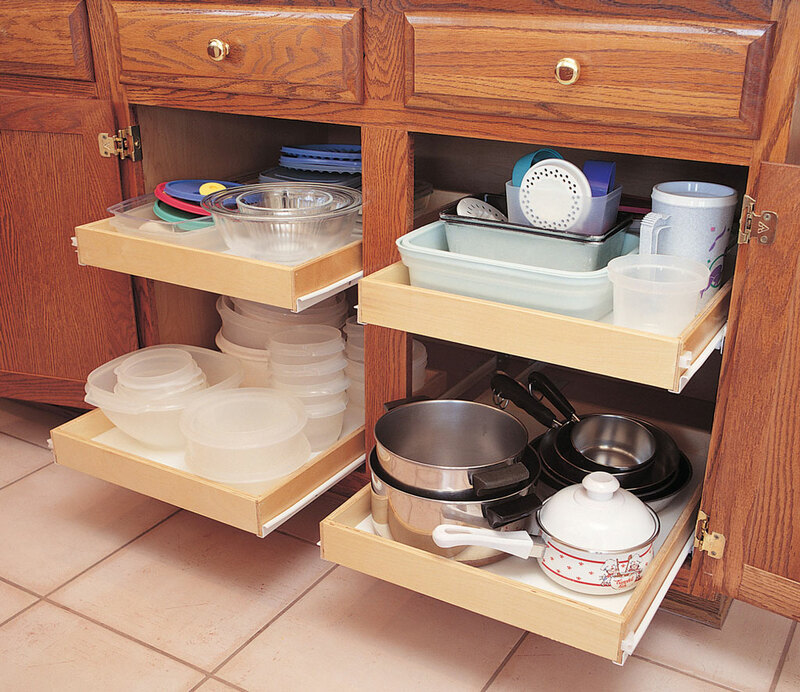 The standard 22" deep (actual 21 3/4") is correct for your cabinet unless you have more than 24" of internal depth. Q. Why can't you publish shipping rates in an easy to find place? Why do most web sites make it so darned hard to find basic information about shipping!? A. Unfortunately, we can only do what the software we use for a shopping cart allows us. You are by no means committing to the sale before you are given the shipping costs. Simply click on the check out button and enter your shipping information. The shipping rates will be calculated and displayed before you have to enter any credit card information. You can also estimate the shipping rate ahead of time in the cart page if you wish. Simply view your cart, hit the "Estimate" button on the cart page, and enter your state and zip if prompted. Q. What hardware do I need to install my Shelves that Slide pull out shelves? Q. How much weight can your sliding shelves carry? A. The weight capacity of our Premium line of sliding shelves is 100 pounds per shelf. Our NewLine and Economy shelves are rated for 75 pounds. We prefer to keep the load below the maximum rating to allow for external pressures (leaning on the shelf etc.). As my chief installer says "my speedometer says my car can do 120 miles per hour, but I am not going that fast"
Q. I have a small 10" deep shelf in my 23" deep cabinet. Can we install a full size sliding shelf here? A. Yes! What you have is a "half" shelf and they are very common. Just make sure you check off the half shelf option when you order. We will provide "L" brackets on the rear of the drawer slides and the front end will attach to the cabinet's face frame (or the side walls if you have euro-style frameless cabinets). Q. What type of payment do you accept? A. We accept American Express, Visa, MasterCard and Discover through Braintree (division of PayPal). We also accept PayPal and Amazon Pay. We do not see your credit card number, nor do we save that information. We process the payment on your credit card when the order is placed. If you want to pay by check we will hold off on building your shelves until payment arrives and clears. Q. I am looking at buying some sliding shelves, and a pull out trash system. How do I figure the shipping cost? A. There is an automatic shipping calculator built into the checkout system. The calculator will figure the shipping rate automatically as part of the checkout process. You can simply proceed with checkout, and you will be given the correct shipping total before you have to enter any credit card information. You can cancel any time before you submit your credit card number. We try to charge very close to the actual shipping charge and we do not charge for the packing materials or the time it takes to carefully wrap the items. Q. Where is the check out button? A. Look at the right side of the store. Near the top, you will see your cart that contains the checkout button (click the cart). Q. How long should it take me to install the kitchen drawers or sliding shelves in my base cabinets? A. That really depends on your ability and what tools you have. We use 90 degree Makita cordless screwdrivers, and we can install kitchen drawers in less than five minutes. If you are somewhat handy and can use a cordless screwdriver, you can probably install your first sliding shelf in 10 to 15 minutes. Additional shelves in base cabinets seem to get easier and quicker. Note that in some locations there is not enough space to get to the back screws with a regular cordless screwdriver. You may find it necessary to use another type of cordless screwdriver here, namely a old fashioned manual type to install your kitchen drawers. Q. I installed my shelves a few months ago and I love them. They have got to be the best thing I have done for myself. How can I thank you enough for building such a wonderful product? A. Tell your friends and neighbors about Shelves That Slide, and our shelf company (and continue to enjoy them everyday). You could post a link to our store on your Facebook page, Tweet about us, or if you have a webpage/blog we would love a link back to our site. Q. When I try to click the measuring guide, nothing happens? A. In order to keep your place in the store, we use a pop-up window to show the measuring guide and several other pages. If you have any pop up stopper programs running, they will block the new page from opening. Please disable pop-ups in your blocker/browser for shelvesthatslide.com to solve this issue. Copyright © 2019 Shelves That Slide.